A Hindu Wanting To Work On Spiritual Awareness Might Decide To Practice Meditation – And there are numerous reasons why. Meditation is one of the main keys toward spiritual awareness and a better spiritual health. But it has many benefits for your physical, mental and emotional health. Hinduism is one of the main religions on the planet. Also known as “The Oldest Religion”. With over one billion followers. This religion is based in different practices. Meditation being only one of them. The Hindus also practice Yoga. Which doesn’t only bring spiritual awareness. But it also creates a balance between your body, mind and spirit. But if you are a Hindu and you want to work only on your spiritual awareness, then Meditation is your best choice. Mantra Meditation: when you practice this meditation, you achieve spiritual awareness by focusing on a mantra. This mantra can be a word, a phrase or a syllable. You can also choose motivational phrases which bring you confidence. Japa Meditation: this is a kind of mantra meditation. But it uses the names of certain Hindu deities. For this meditation you can also prepare an altar for the deity that you want to meditate for. OM Meditation: another mantra meditation. Which uses the syllable “Om”. In Hinduism, the syllable or symbol Om is sacred. It is the first sound that ever existed. “I AM” Meditation: Ramana Maharshi developed this meditation. This meditation brings spiritual awareness by focusing on the question “who am I?”. And also finding an answer. This meditation focuses on the “Ego”, the center of every individual’s being. Yoga Meditation: this category of meditation practices contains numerous meditations that were developed by and for yogis. Therefore, these meditations work great in yoga sessions. Some examples are: chakra meditation, Kriya meditation, Kundalini meditation, tantra meditation and many more. Transcendental Meditation: the developer of this highly popular meditation is Maharishi Mahesh Yogi. Due to the high number of celebrities practicing it, TM spread very quickly all around the western world. Transcendental Meditation is also a mantra meditation. But only the initiates know the exact mantras used. And only for a huge amount of money. But, still, this meditation practice succeeded in gathering more than 5 million practitioners. 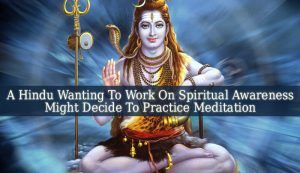 In conclusion, A Hindu Wanting To Work On Spiritual Awareness Might Decide To Practice Meditation because it is the most efficient practice in evolving spiritually. Meditation brings you not only awareness, but also mindfulness, cleaner mind and thoughts and a better mood. Next What Is The Purpose Of The Mantra During Meditation?